There has been a lot of talk on this site about avocados in the dead of winter. I see the irony of this situation: seasonal girl talking about foods out of season. But let me defend myself for just a moment. I like avocado (I told you I was simple). When I am in the produce section smelling, poking, and selecting the week’s ingredients, sometimes seasonal just does not matter. In this magnificent modern world of ours, there is perfectly ripe, edible, and organic produce available to us out of season. I am not ashamed to grab a ripe avocado (or 4) to make grub in the middle of a snow storm, and you shouldn’t be either. Especially if you are about to make this chicken salad. Avocado replaces much of the mayonnaise in this recipe creating a luxuriously creamy and fresh chicken salad filled with more nutrients and even more flavor per inch. Using a store bought rotisserie chicken is another time saver. This recipe is all about ease and comfort. It doesn’t hurt that my husband absolutely adores it. He eats this salad piled high on toast, and I simply love it on top of a baby spinach and tomato salad with a sprinkle of course celtic sea salt. That’s how we roll. 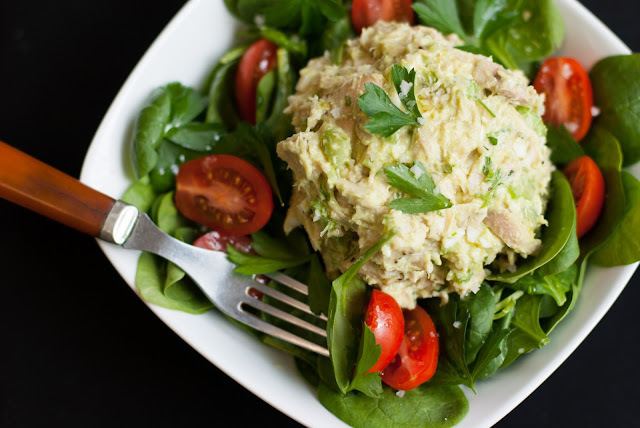 In a large bowl combine shredded chicken, celery, onion, egg, avocado, lemon juice, mayonnaise, salt and pepper. Using a potato masher, “mash” all of the ingredients together until desired consistency. Toss with fresh parsley and serve. Note: This makes enough chicken salad to feed a large family or an active, hungry man for a few days. The lemon juice helps to keep the avocado from browning; however, to ensure it stays fresh keep it in an air tight container with a layer of saran wrap tucked on top so no air seeps through. Wellll... I'm eating an avocado right now, so I can't judge. I eat *mostly* seasonally, but sometimes you just need some creamy goodness. Love the look of this salad! Seasonal or not. If I like it, I eat it and this salad sounds great!!! Ohhh yummy! I might use leftover rotisserie chicken for this salad. 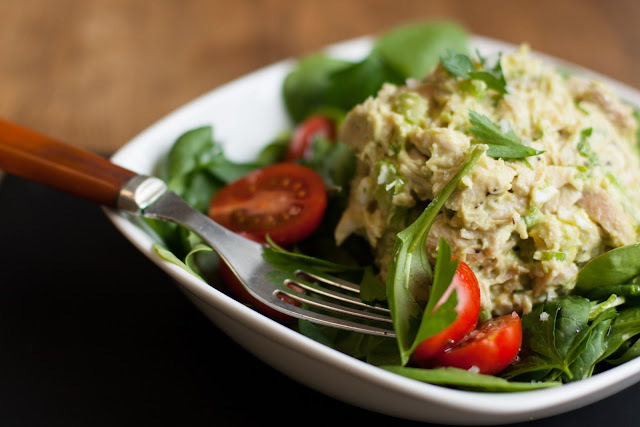 I usually use it for pasta etc, but this avocado salad looks great with the chicken! i am constantly posting recipes that feature ingredients 'out of season', but there aren't many bloggers in Ecuador so my season gauge probably seems off to most food bloggers! Yum!! This looks so lovely. what a great, healthy idea!